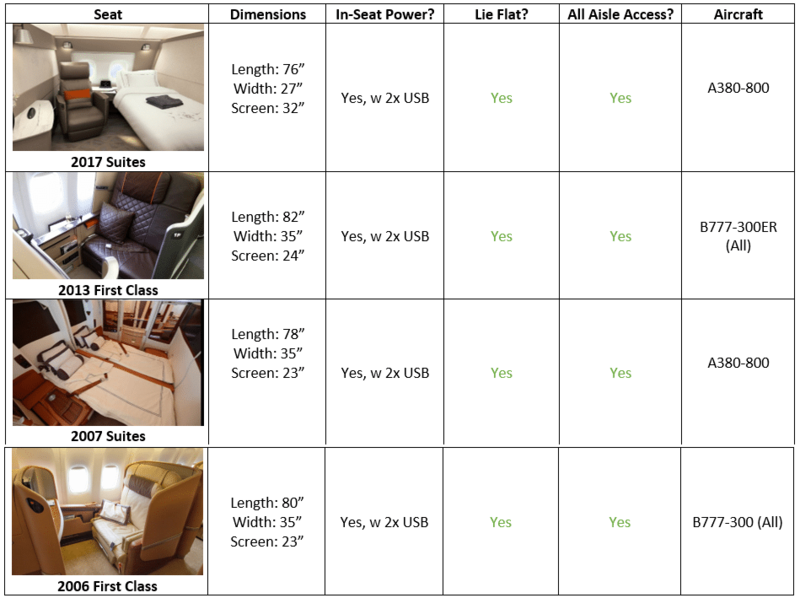 Spend your miles on the right cabin products by knowing the four different types of SQ First and Suites Class seats. Flying First Class for the first time is an unforgettable experience, and the pinnacle of any travel hacker’s journey. It’s also likely to blow a big hole in your miles balance, so you want to make sure you get the best possible experience .That all starts with picking the right seat. How many different First & Suites Class seats are out there? 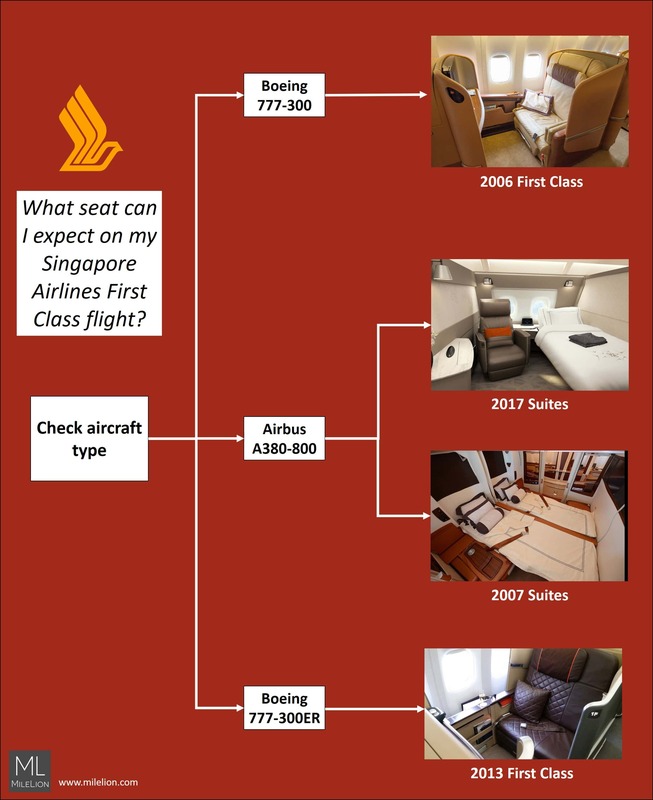 Singapore Airlines currently uses four different types of First & Suites Class seats across their fleet. Here’s a brief summary of their key traits, and which aircraft you’ll find them on. The year in front of the name refers to the year the product was introduced. If you’d like to read up more details on each individual seat, have a read of The Milelion’s Seat and Fleet Guide. The simplest way of telling what First or Suites Class seats you can expect on your flight is to look at the aircraft type. You’ll be able to find this in your booking confirmation, or during the booking process. As you can see, in most cases simply knowing the aircraft type is sufficient to deduce what kind of seat you have. For example, if you’re on the B777-300ER, you’ll have a single row of 1-2-1 configured 2013 First Class seats. If you’re on the B777-300, that’ll be two rows of 1-2-1 configured 2006 First Class seats. However, there is one type of aircraft where it’s slightly less clear- the A380-800, which has a mixture of the 2007 and 2017 Suites seats. Go and look at the seatmap for your aircraft, which you can check out under the Manage My Booking page or during the booking process, before you make payment. 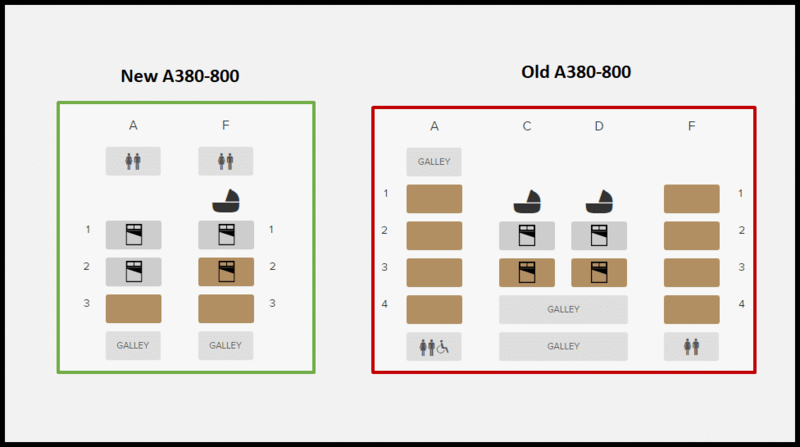 If your seatmap looks like the one on the left in green (with 6 seats in the cabin), you have the 2017 Suites. If your seatmap looks like the one on the right in red (with 12 seats in the cabin), you have the 2007 Suites. So that’s how you figure out which First Class or Suites seat you can expect! If you found this guide useful, be sure to check out the guide for Business Class seats. When will they update the A380 first class cabin out of JFK ? Would you be able to do a post on first class seats across different airlines??? SQ is great, but there are some really fantastic first class products available on other airlines as well. Will make for a wonderful reading experience as well. Hi Aaron, do you know where the rest of the 2007 First Class A380s are currently being deployed to?